Use a sharp knife or peeler and carefully peel the artichokes. Cut them into 2cm chunks. Squeeze the lemon juice into a bowl of cold water, large enough to contain the chunks, and place them in the water (to stop them discolouring). Put a large saucepan on a medium heat, add the butter and as it sizzles add the shallots and a pinch of salt. Stir and soften, about five minutes. Add bay leaves and thyme leaves, drain and add the artichokes, stir and mix. Add 200 ml (7fl oz) of water to the pan, bring to a simmer, reduce the heat and cover to cook gently for 10 to 12 minutes. When starting to soften add the cream, simmer and cook to slightly reduce the sauce. When the artichokes are tender, season with pepper, remove from the heat, take out the bay leaves and set aside. When you’re ready, heat the oven to 200C/180C fan/gas 6. 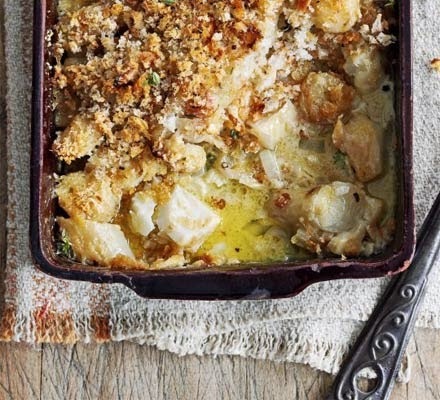 Grease a gratin dish with a little butter, place the smoked haddock cubes in it – you want one layer, pour over the artichokes and sauce evenly, top with the breadcrumbs and dot with the extra butter. Put the gratin dish on a baking sheet and bake for 30 minutes. The top should be golden brown and bubbling.